All things Yen and mummy!!! 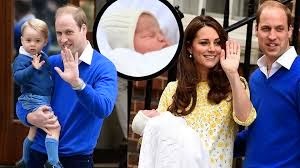 : Congratulations to Princess Kate and Prince William!!!!! Congratulations to Princess Kate and Prince William!!!!! I'm not really into the royal family and stuff but there's something about Kate that I like, maybe it's because she kind of reminds me of Princess Diana maybe because she's so down to earth. I don't know I just like her, I am so glad she has just given birth to a baby girl. I'm happy for them especially for that gorgeous little boy George now he has a little sister. I just want to squeeze he's cheeks he's so cute. Enough of how cute he is lol I hope they name the baby girl Alice, I think it's such a nice name. Little Prince George and Princess Alice yeah I love it lol.